Asheville is getting its first glimpse of autumn hues popping up around the mountains and it won’t be much longer until peak fall color is widespread. This is great news for anyone making plans to leaf peep across the Blue Ridge Mountains this season, which experts have forecast to be one of the best in several years. 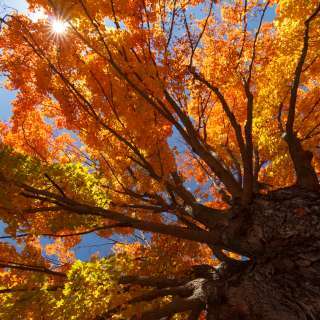 Our fall color hunters are reporting a number of trees already in transition. Howie Neufeld, Appalachian State University Biology Professor and Fall Color Guy, says to be on the lookout for yellow buckeyes, which are typically among the first trees to transition into fall color. Maples, Sourwoods, and Fraser Magnolias are also beginning to change. Cowee Mountain Overlook (elevation 5,950 feet): Located south of Asheville along the Blue Ridge Parkway, at milepost 430.7, you’ll find pockets of color are appearing along this ridge. We anticipate the color will become widespread as the week continues. 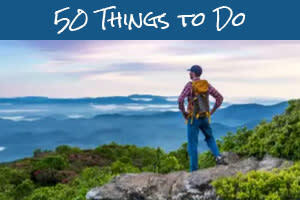 Grandfather Mountain (elevation 5,945 feet): This High Country destination is a perfect day trip from Asheville. They’re reporting color transformation across nearby peaks, specifically those with thin, shallow soil. Presently, red maples and yellow birches are starting to turn, exhibiting bright red and orange hues. Craggy Gardens (elevation 5,500 feet) – This is your hike pick of the week to catch a variety of end-of-summer wildflowers in bloom. Look for goldenrod, jewelweed, white snakeroot, asters, evening primrose, black-eyed Susans, and pink turtleheads. You may also spot the bright red berries of Hawthorn and Mountain Ash trees. NEW! Be among the first to visit Hickory Nut Gap Farm’s new kitchen & butchery, and take a tour of their working farm. They’ve added fun family activities to the mix including hayrides, a corn maze, culvert slides, a hay climb, corn hole, and a lot more. 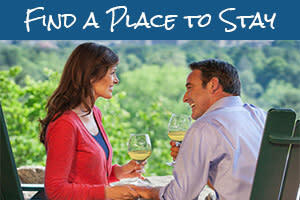 Farms & Artisans Travel Package: The Asheville Bed & Breakfast Association has partnered with three local farms, a vineyard, and five local artisans to provide a unique experience this fall. This travel package includes two nights at a beautiful B&B, a picnic lunch at a winery, and tours of local farmsteads with the option to purchase local meats, honey, and handmade crafts. 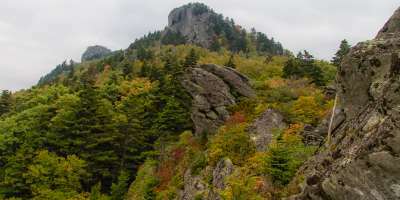 Photos from top: Linville peak as seen from the Cliffside overlook at Grandfather Mountain; photo by Monty Combs. 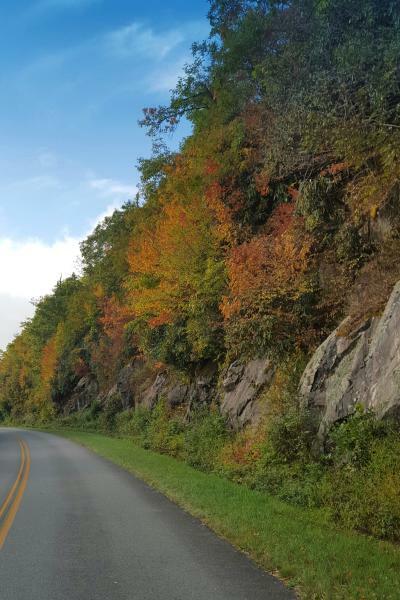 Early pockets of fall color along the Blue Ridge Parkway near Mount Pisgah; photo by Keith Yeatman.